ologen™ Collagen Matrix is a biodegradable and implantable ECM mimic specifically configured to support and modulate tissue repair processes in connective and epithelial ocular tissues. 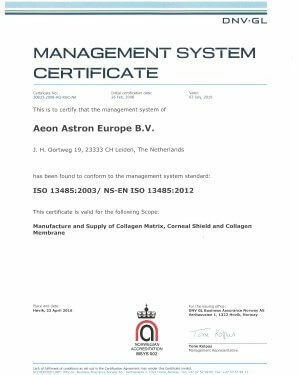 As a soft and pliable medical device, ologen™ Collagen Matrix is highly absorbent and serves as a dynamic physiological reservoir system that can modulate the process of wound healing and restoration functionality with its ability to hold ten to fifty times its own weight in fluids. 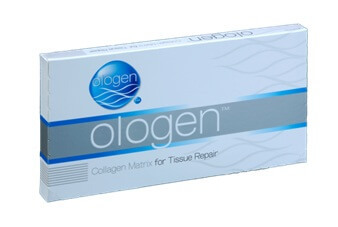 The host tissue-collagen matrix interaction may further optimize and stabilize the restoring structure and composition where damage, weakness, or laxity exists, hence creates a healthy and mature tissue structure by preventing scar formation with the help of ologen™ Collagen Matrix. 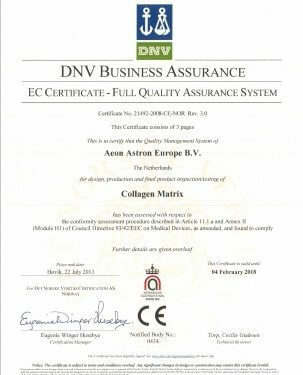 ologen™ Collagen Matrix is a dry form of scaffold that contains a connected porous structure of 10 – 300 μm diameter made of cross-linked lyophilized porcine type I atelocollagen (≥90%) and glycosaminoglycans (GAG) (≤10%). Biomechanical support the 3-D porous structure of ologen™ Collagen Matrix provides a biomechanical support and enables the attachment and proliferation of ocular tissue cells, as well as fibroblast ingrowth. Decreased contraction the 3-D porous structure of ologen™ Collagen Matrix interrupts continuous inward contraction of the wound bed. Random orientation of collagen generated the 3-D porous structure of ologen™ Collagen Matrix interrupts the alignment of fibroblasts and therefore enables a random pattern of collagen deposition of fibroblast.